The Milky Way is inhabited by a variety of unique characters from many different sapient species, most of whom base their technological achievements on that of an ancient civilization called the Protheans. The advanced technology left by the Protheans includes quantities of a substance called "Element Zero", which can be used to alter the mass of anything near it. By using this "mass effect", the galaxy's many races are able to develop technologies such as faster-than-light travel, force fields and artificial gravity. Roughly three-thousand years before the start of the series, a galactic community was formed from the remnants of the Prothean civilization. 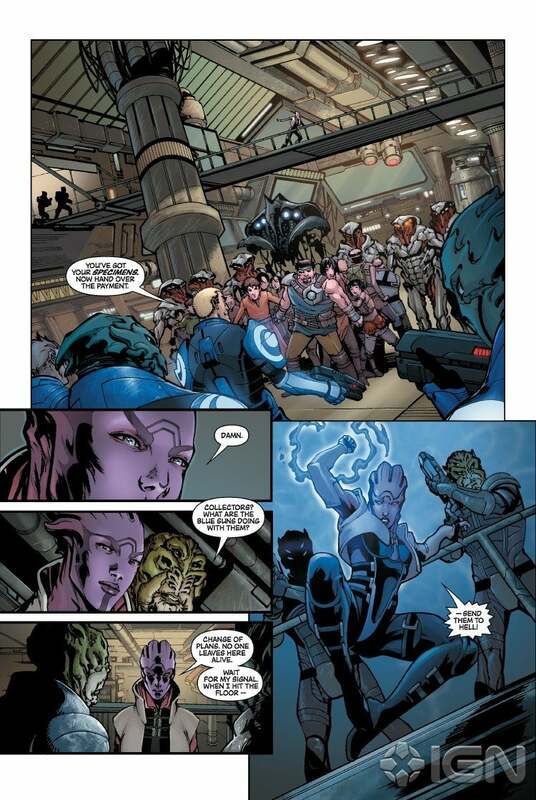 This community is headed by the Citadel Council, a bureaucratic association led by three unique species: the Asari, a race of monogendered beings closely resembling blue-skinned human women; the Salarians, an amphibious species with considerable technological prowess; and the Turians, a heavily militaristic race of raptor-like humanoids. Over the centuries, the Council has encountered many other species that have become close political associates, while others remain independent. In 2148, explorers on Mars discover ruins of a Prothean outpost. Additionally, Charon is discovered to be an artifact called a "mass relay", which enables near-instantaneous travel to Arcturus; it is one of many mass relays littered about the galaxy. Their use allows humanity to come in contact with the Citadel Council and its associate species. As of the year 2183 (the time in which the first game is set), humankind is the newest species to join the galactic community and is still working to make a name for itself. The Citadel Council partitioned the Milky Way into five different sectors, known as the Terminus Systems, the Attican Traverse, Inner and Outer Council Space, and Alliance Space. Earth is a significant setting, particularly in the third instalment. A space station known as the "Citadel", which was discovered by the current inhabitants of the Milky Way, serves as the capitol for the galaxy; most species have an embassy there, and the Council meets there to deliberate matters of galactic import. A trilogy of games has been released, each continuing the previous game's story in chronological order. The Mass Effect series combines action role-playing game elements, with the main series games being in third-person perspective. The protagonist can use two AI-controlled squad members in battle, which usually consist of members he or she has recruited from various places and for various reasons, and taken onto the SSV Normandy, Shepard's stealth-recon starship. The player could make prospective decisions depending upon the situation. At these times, the player has multiple sets of dialogue choices with which to respond to NPCs, separated by tone. Starting from Mass Effect 2, the player can interrupt cut-scenes calmly or aggressively. The games often have various mini-games in them as well, such as drinking, dancing and romancing characters. Mass Effect (2007), the first game in the series, was originally created as an exclusive title for the Xbox 360 but was later ported to Microsoft Windows by Demiurge Studios, and to the PlayStation 3 by Edge of Reality. The game focuses on the protagonist, Commander Shepard, and their quest to stop the rogue Spectre Saren Arterius from leading an army of sentient machines, called the Geth, to conquer the galaxy. During pursuit of Saren, Shepard develops key relationships with other characters, primarily their squad team members, all while learning of a far greater threat in the form of the Reapers. Saren has been mentally enslaved by the Reaper vanguard Sovereign, and sent into Citadel Space to initiate the purge of all advanced organic life in the galaxy, a cycle repeated by the Reapers every 50,000 years. Mass Effect 2, the second main game in the series, was released on January 26, 2010, in North America and January 29 in Europe. A great deal of secrecy surrounded the game prior to launch, with few details emerging other than Casey Hudson, Project Director for BioWare, stating that "players should keep their save files, because decisions made by the player in the first game will continue to have influences on their character in the sequel". The game takes place two years after the events of Mass Effect. Human colonies are being attacked, their colonists disappearing without a trace. The game's protagonist, Commander Shepard, is forced into an uneasy alliance with the pro-Human paramilitary organization, Cerberus, in an effort to discover the cause. Evidence emerges pointing to the "Collectors", an advanced, enigmatic race of insect-like humanoids. Adding to the threat is the revelation that the Collectors are working for the Reapers. Shepard sets out on a "suicide mission" to stop the Collectors, accompanied by a hand-picked team of soldiers, assassins, mercenaries, and specialists. Mass Effect 2 has received overwhelming critical and public praise since its release, for its characters, storyline, voice acting, and refined combat and gameplay with many critics calling it a major improvement over the original and an easy Game of the Year contender despite its January release. At Gamescom 2010, it was announced that a PlayStation 3 version would become available, which was released on January 18, 2011. Mass Effect 3, the third instalment in the Mass Effect trilogy, was released on March 6, 2012. Casey Hudson commented that Mass Effect 3 "will be easier [to develop] because we don't have to worry about continuity into the next one". However, decisions are routinely imported from the two previous titles to Mass Effect 3 in order to maintain continuity within the series. In the final chapter of the trilogy, the Reapers have returned in force, and have begun their purge of the galaxy, attacking Earth. During this attack Commander Shepard is on Earth and forced to flee. After fleeing Earth, Commander Shepard must hurry and rally the advanced races of the galaxy to make one final stand, not only to save Earth, but also to break a cycle that has continued for millions of years (hence providing the answer to Fermi's Paradox). The first official trailer was unveiled on December 11, 2010, during the Spike TV Video Game Awards. Mass Effect: Andromeda, the first game in a new series, and the fourth major instalment overall in the franchise, was revealed at E3 2015. It was released on March 21, 2017. The title utilizes EA DICE's Frostbite 3 engine and was released for Microsoft Windows, PlayStation 4 and Xbox One. Andromeda is the first game in the series to feature an open world environment and began during the time in which Mass Effect 2 takes place, then jumps 634 years into the future. The player's character is either Sara or Scott Ryder, designated as a Pathfinder – an operative tasked with discovering new planets in the Andromeda Galaxy. Mass Effect: New Earth (2016): A 4D holographic experience introduced at California's Great America amusement park in 2016. Mass Effect: Revelation (2007), by Drew Karpyshyn: The first novel based on Mass Effect, the plot is centred around then-Lieutenant David Anderson and tells the story of how he came to know Saren as well as the beginning of his relationship with Kahlee Sanders. It expands on the history of the Mass Effect universe and reveals in detail how Anderson failed to become the first human Spectre. Mass Effect: Ascension (2008), by Drew Karpyshyn: The second novel based on Mass Effect, the plot centres around protagonist Paul Grayson, a member of Cerberus, who is in charge of raising a biotic girl named Gillian. It is set some two months after the ending events of the first game. Mass Effect: Deception (2012), by William C. Dietz: The fourth Mass Effect novel, it centres on Gillian Grayson. Response to the novel has been largely negative due to inconsistencies with lore and characterization, prompting fans to petition BioWare to disregard the novel as canon. In response, BioWare and Del Rey announced that a number of changes would be made in future editions. Mass Effect: Nexus Uprising (2017), by Jason M. Hough and K. C. Alexander: The novel is the first of three intended to weave directly into Mass Effect: Andromeda, taking place "concurrently with the adventure of the game itself". The novel was published by Titan Books. Mass Effect: Annihilation (2018) by Catherynne M. Valente: This is the third and final novel in the Mass Effect: Andromeda book trilogy, and was published by Titan Books. Mass Effect: Pick Your Path (2012) is an unofficial, popular interactive fiction novel written by Mike Kayatta that runs parallel to the events of Mass Effect 2. It follows the exploits of an unnamed Citadel merchant who chases Commander Shepard around the galaxy to gain an endorsement for his shop. Encouraged by The Illusive Man for unknown reasons, the merchant becomes haplessly entangled with the dangerous aftermath of Shepard's various adventures. The story, considered similar to the Choose Your Own Adventure series of books, features the same choice-driven format of the games, allowing the reader to choose between "paragon" or "renegade" actions, drastically affect the ending, and even romance a selection of unique party members. The full story was published by The Escapist in March 2012. Writer Mac Walters in front of a Mass Effect poster at the Dark Horse Comics booth at the 2011 New York Comic Con. Mass Effect: Blasto: Eternity Is Forever is a 14-page single-issue written by Mac Walters released on November 7, 2012, through digital distribution. The main character is Blasto, the protagonist of several in-universe films, depicted as the galaxy's first Hanar Spectre. As of April 13, 2017. The Mass Effect series, particularly the second and third games, has received universal acclaim. 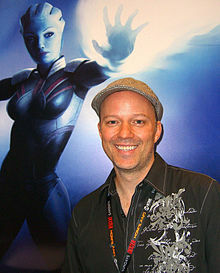 Colin Moriarty stated that "the Mass Effect series is one of the defining video game franchises of [the seventh] generation". GamesRadar called Mass Effect the best new franchise of the (then seventh) generation, saying "The galaxy was so well-constructed that it felt like a decades-old franchise and represented a high-water mark for video games as a story-telling medium." IGN rated the Mass Effect trilogy the best Xbox 360 game(s) out of a list of 25, despite being multiplatform. Mass Effect 2 is widely considered to be one of the greatest games of all time. It garnered numerous game of the year awards and is critically the most successful game in the series. It received over 70 perfect review scores. While Mass Effect 3 also garnered critical acclaim, controversy surrounded its release due to the public's reaction and refusal to accept the game's (and the trilogy's) ending. This eventually led to BioWare releasing an "extended cut" patch to the ending of Mass Effect 3 which would expand upon, but not replace it. Mass Effect 3 was the most commercially successful game of the series, selling over twice as many copies as Mass Effect 2 in their respective launch months and generating lifetime sales of over six million copies. The fourth installment, Mass Effect: Andromeda received mixed critical reception and was considered not up to par with the original trilogy. Two weeks after the game was released, Mass Effect 2 shipped two million copies to retailers. The game sold over 500,000 copies in the month of release, despite being released at the end of the month. Before the release of the third game, the series sold a total of 7 million copies worldwide. Mass Effect 3 sold over 800,000 copies in its first 24 hours, and its opening month sales were twice that of its predecessor's, selling over 900,000 copies on the Xbox 360 version, outselling the PlayStation 3 version 4 to 1 and bringing in over $200 million in revenue. As of July 5, 2014, the Mass Effect series had sold a total of 14 million units. By the end of March 2018, at least 2.5 million retail copies of Andromeda had also been shipped for $110 million in revenue; additionally, more than 0.35 million copies of the game were purchased digitally in March, and $53 million in net sales from digital and special editions for Andromeda were generated in March but deferred to a later date, putting total lifetime sales for the franchise at over 17 million. ^ "Mass Effect: Andromeda: release date, setting, combat, story – everything we know". PCGamesN. Retrieved 2017-01-27. ^ Reilly, Jim. "Mass Effect 2 Release Date Announced". ^ GI Staff (March 2008). "Afterwards: Mass Effect". Game Informer (179). p. 24. ^ Brudvig, Erik (February 23, 2009). "BioWare Suggests Hanging on to Mass Effect Saves". IGN. Retrieved March 8, 2009. ^ Mike Fahey (March 4, 2011). "Mass Effect 3 Thrusts Its Way into Early 2012". Kotaku. Retrieved March 4, 2011. ^ "BioWare Already Looking Forward to Mass Effect 3". ^ "Choose Language | BioWare Social Network". Meforums.bioware.com. Archived from the original on January 7, 2010. Retrieved January 7, 2013. ^ "A Mass Effect 3 Gameplay Preview". Archived from the original on November 3, 2014. ^ "Interview: BioWare's Casey Hudson on the making of Mass Effect 2". ^ Matulef, Jeffrey (January 28, 2016). "New Titanfall game and Mass Effect: Andromeda coming in the next 14 months". Eurogamer. Retrieved January 29, 2016. ^ Hamilton, Kirk (February 7, 2012). "BioWare's Mass Effect iOS Game is the Third-Person Shooter Mass Effect: Infiltrator". Kotaku. Retrieved February 7, 2012. ^ "Explore – CA Great America". www.cagreatamerica.com. ^ "Drew Karpyshyn Creative Works". Drewkarpyshyn.com. Retrieved January 7, 2013. ^ "Mass Effect: Retribution Announced". ^ "Canon errors in Mass Effect: Deception". Retrieved January 7, 2013. ^ "Mass Effect Tie-in Novel Filled with Errors". IGN. Retrieved January 7, 2013. ^ "Mass Effect 3 Official Forum – Del Rey and Bioware comment on Mass Effect: Deception". Social.bioware.com. Retrieved January 7, 2013. ^ "Announcement: official Mass Effect novels coming from Titan Books in 2017!". Titan Books. June 12, 2016. Retrieved December 21, 2017. ^ "Mass Effect: Initiation - Titan Books". Titan Books. November 28, 2017. Retrieved December 21, 2017. ^ Pierse, Conal (October 25, 2017). "Announcing Mass Effect: Annihilation". BioWare. Retrieved December 21, 2017. ^ "Mass Effect: Pick Your Path". Escapist Magazine. March 28, 2012. ^ Schedeen, Jesse (July 21, 2009). 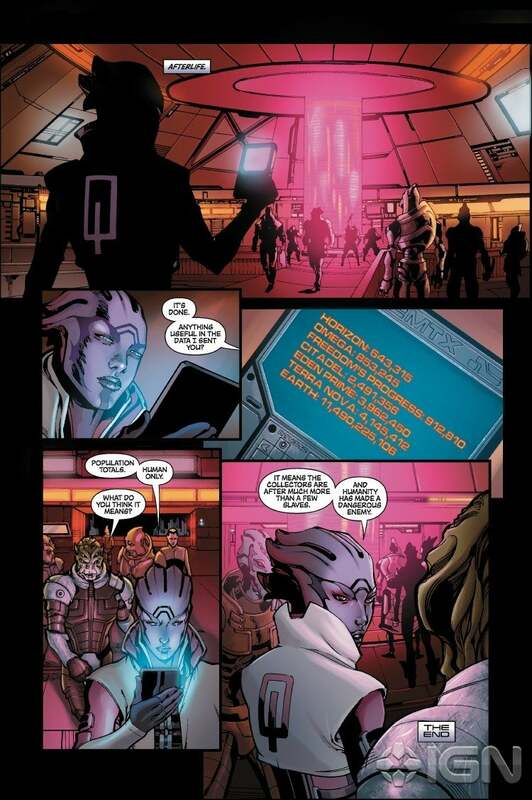 "Mass Effect Comes to Comics". IGN. Retrieved April 5, 2013. 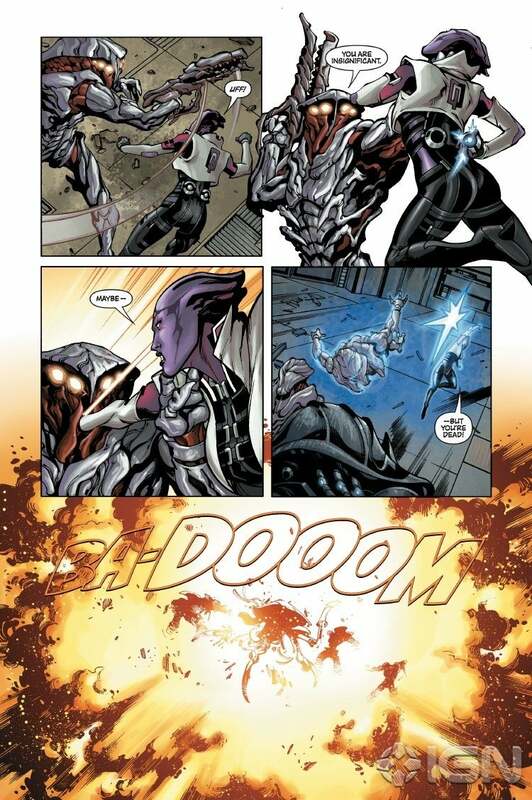 ^ "Mass Effect Explodes Into Comics!". Dark Horse Comics. July 21, 2009. Retrieved April 5, 2013. ^ "Mass Effect: Invasion". IGN. January 2010. Retrieved April 6, 2013. ^ "Mass Effect: Redemption #1". Dark Horse Comics. January 6, 2010. Retrieved April 5, 2013. ^ "Mass Effect: Redemption #2". Dark Horse Comics. February 3, 2010. Retrieved April 5, 2013. ^ "Mass Effect: Redemption #3". Dark Horse Comics. March 3, 2010. Retrieved April 5, 2013. 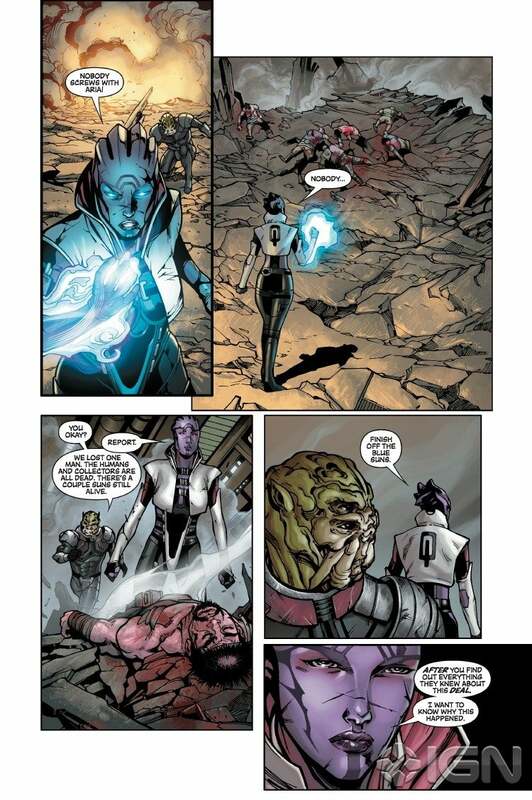 ^ "Mass Effect: Redemption #4". Dark Horse Comics. April 7, 2010. Retrieved April 5, 2013. ^ "Mass Effect: Redemption #1". Dark Horse Comics. April 20, 2011. Retrieved April 7, 2013. ^ "Mass Effect: Redemption #2". Dark Horse Comics. April 20, 2011. Retrieved April 7, 2013. ^ "Mass Effect: Redemption #3". Dark Horse Comics. April 20, 2011. Retrieved April 7, 2013. ^ "Mass Effect: Redemption #4". Dark Horse Comics. April 20, 2011. Retrieved April 7, 2013. ^ George, Richard (June 21, 2010). "Exclusive Mass Effect Short Story". Dark Horse Comics via IGN. Retrieved April 6, 2013. 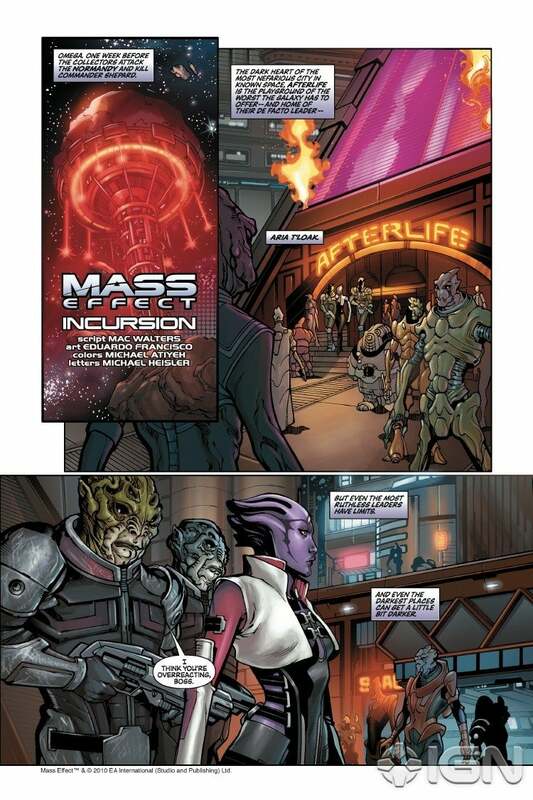 ^ "Mass Effect: Incursion – Page 1". Dark Horse Comics via IGN. June 21, 2010. Retrieved April 6, 2013. 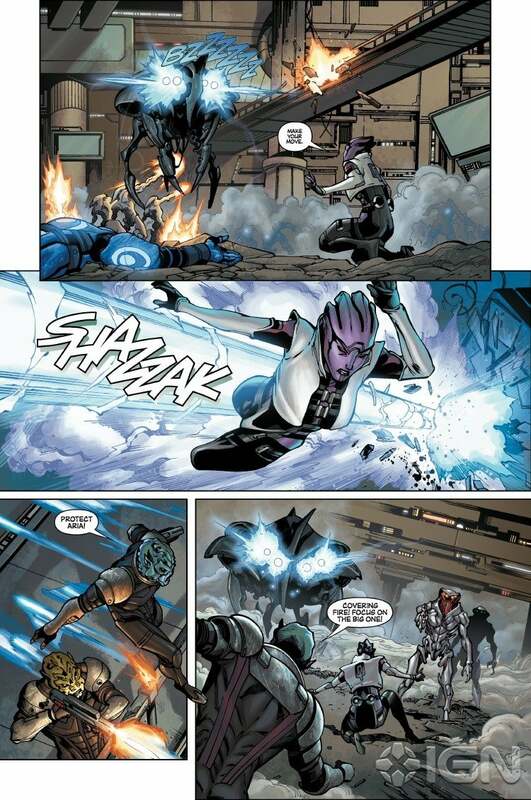 ^ "Mass Effect: Incursion – Page 2". Dark Horse Comics via IGN. June 21, 2010. Retrieved April 6, 2013. ^ "Mass Effect: Incursion – Page 3". Dark Horse Comics via IGN. June 21, 2010. Retrieved April 6, 2013. 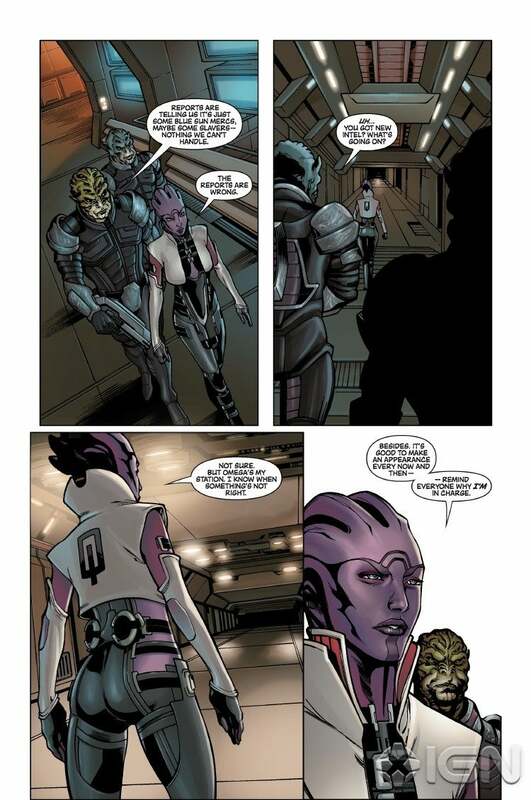 ^ "Mass Effect: Incursion – Page 4". Dark Horse Comics via IGN. June 21, 2010. Retrieved April 6, 2013. 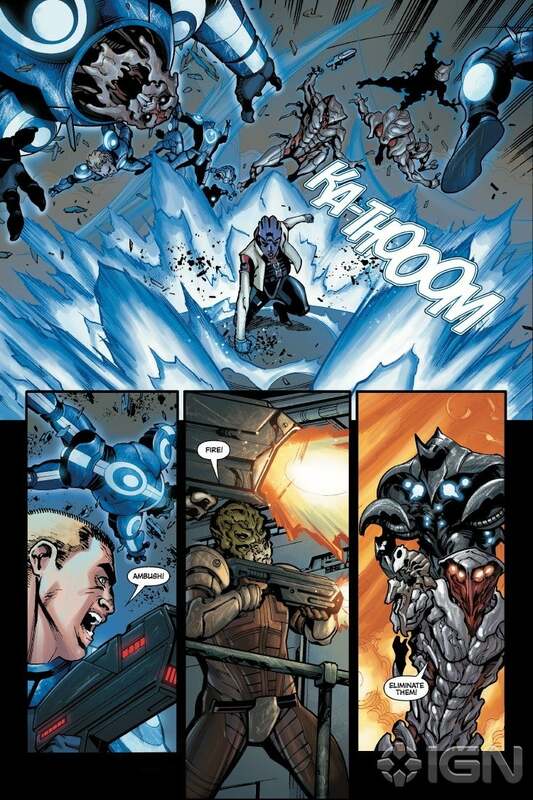 ^ "Mass Effect: Incursion – Page 5". Dark Horse Comics via IGN. June 21, 2010. Retrieved April 6, 2013. ^ "Mass Effect: Incursion – Page 6". Dark Horse Comics via IGN. June 21, 2010. Retrieved April 6, 2013. ^ "Mass Effect: Incursion – Page 7". Dark Horse Comics via IGN. June 21, 2010. Retrieved April 6, 2013. ^ "Mass Effect: Incursion – Page 8". Dark Horse Comics via IGN. June 21, 2010. Retrieved April 6, 2013. ^ Hargro, Tory (October 24, 2010). "'Mass Effect: Inquisition' is ready to blast off". USA Today. Retrieved April 6, 2013. ^ George, Richard (July 15, 2010). "SDCC 10: Mass Effect: The Origin of the Illusive Man". IGN. Retrieved August 3, 2010. ^ LeMoyne, R. B. (October 9, 2011). "Review – Mass Effect: Conviction". Comic Booked. Retrieved April 7, 2013. ^ "Mass Effect: Conviction – Imgur". Imgur. Retrieved April 7, 2013. ^ "Mass Effect: Invasion". IGN. October 2011. Retrieved April 5, 2013. ^ "Mass Effect: Invasion #1 (Massimo Carnevale cover)". Dark Horse Comics. October 19, 2011. Retrieved April 6, 2013. ^ "Mass Effect: Invasion #1 (Paul Renaud 25th anniversary cover)". Dark Horse Comics. October 19, 2011. Retrieved April 6, 2013. ^ "Mass Effect: Invasion #2 (Massimo Carnevale cover)". Dark Horse Comics. November 16, 2011. Retrieved April 6, 2013. ^ "Mass Effect: Invasion #2 (Paul Renaud variant cover)". Dark Horse Comics. November 16, 2011. Retrieved April 6, 2013. ^ "Mass Effect: Invasion #3 (Massimo Carnevale cover)". Dark Horse Comics. December 21, 2011. Retrieved April 6, 2013. ^ "Mass Effect: Invasion #3 (Paul Renaud Variant cover)". Dark Horse Comics. December 21, 2011. Retrieved April 6, 2013. ^ "Mass Effect: Invasion #4 (Massimo Carnevale regular cover)". Dark Horse Comics. January 18, 2012. Retrieved April 6, 2013. ^ "Mass Effect: Invasion #4 (Paul Renaud variant cover)". Dark Horse Comics. January 18, 2012. Retrieved April 6, 2013. ^ Narcisse, Evan (April 1, 2012). "Mass Effect's Newest Cast Member Kicks Off New Dark Horse Comics Series". Kotaku. Retrieved April 5, 2013. ^ "Mass Effect: Homeworlds". IGN. April 2012. Retrieved April 5, 2013. ^ "Mass Effect: Homeworlds #1 (Anthony Palumbo cover)". Dark Horse Comics. April 25, 2012. Retrieved April 5, 2013. ^ "Mass Effect: Homeworlds #1 (Mike Hawthorne Variant cover)". Dark Horse Comics. April 25, 2012. Retrieved April 5, 2013. ^ "Mass Effect: Homeworlds #2 (Anthony Palumbo cover)". Dark Horse Comics. May 30, 2012. Retrieved April 5, 2013. ^ "Mass Effect: Homeworlds #2 (Mike Hawthorne Variant cover)". Dark Horse Comics. May 30, 2012. Retrieved April 5, 2013. ^ "Mass Effect: Homeworlds #3 (Anthony Palumbo cover)". Dark Horse Comics. July 25, 2012. Retrieved April 5, 2013. ^ "Mass Effect: Homeworlds #3 (Mike Hawthorne variant cover)". Dark Horse Comics. July 25, 2012. Retrieved April 5, 2013. ^ "Mass Effect: Homeworlds #4 (Anthony Palumbo cover)". Dark Horse Comics. August 29, 2012. Retrieved April 5, 2013. ^ "Mass Effect: Homeworlds #4 (Mike Hawthorne variant cover)". Dark Horse Comics. August 29, 2012. Retrieved April 5, 2013. ^ "Mass Effect: Blasto – Eternity is Forever (Digital Exclusive)". Dark Horse Comics. November 7, 2012. Retrieved April 5, 2013. ^ Narcisse, Evan (October 14, 2012). "Mass Effect 3's Best Action Hero Is Getting His Own Comic". Kotaku. Retrieved April 5, 2013. ^ Celestin-Greer, Ajané (December 10, 2012). "Mass Effect's Blasto Gets His Own Comic". Gameranx. Retrieved April 5, 2013. ^ "Free Comic Book Day 2013: Mass Effect/Killjoys/R.I.P.D. :: Profile :: Dark Horse Comics". darkhorse.com. ^ Slabaugh, Brett (March 3, 2013). "Mass Effect: Foundation Expands Shepard's Universe". The Escapist. Retrieved April 5, 2013. ^ Bosier, Jen (March 3, 2013). "Dark Horse Announces Mass Effect: Foundation Comic Series". Forbes. Retrieved April 5, 2013. ^ Barlow, Jeremy (May 24, 2017). "Mass Effect: Discovery". Dark Horse Comics. Retrieved March 12, 2018. ^ "'Mass Effect' video game on way to movie screen". ^ Legendary Pictures. "Comic Con Q&A Mass Effect". Legendary Pictures. Archived from the original on September 24, 2011. ^ Justin Kroll and Marc Graser. "Legendary arms 'Mass Effect' with new scribe". Variety. ^ "Funimation. T.O to Make Anime Movie of Mass Effect Games". Anime News Network. April 7, 2011. ^ "Paragon Lost BD & DVD release date changes". ^ a b "This Fan-Made Mass Effect Film is Shaping Up Nicely". Kotaku. December 5, 2011. ^ "Link to Wired.co.uk Article: Fans create interactive 'Mass Effect' film for YouTube". Wired. February 21, 2012. Archived from the original on May 5, 2013. ^ "This Mass Effect Movie Actually Stars the Real Commander Shepard". Kotaku. February 16, 2012. ^ "Move over Hollywood, Mass Effect fans bring game to film". MSNBC. May 24, 2012. Archived from the original on September 6, 2012. ^ "Holy Mark Meer, Batman! Red Sand Looks Amazing!". Gameverse. May 23, 2012. ^ "USAopoly To Unveil New Games Based On The Hottest Licenses And Iconic Brands". PR Newswire. February 11, 2013. Retrieved April 4, 2013. ^ Andrew Goldfarb (February 12, 2013). "Mass Effect Risk Coming This Year". IGN. Retrieved April 4, 2013. ^ "Mass Effect Reviews". Metacritic. Retrieved November 10, 2011. ^ "Mass Effect 2 Reviews". Metacritic. Retrieved November 10, 2011. ^ "Mass Effect 3 Reviews". Metacritic. Retrieved November 10, 2011. ^ "Mass Effect 3: Special Edition Reviews". Metacritic. Retrieved November 10, 2011. ^ "Mass Effect: Andromeda Reviews". Metacritic. Retrieved March 20, 2017. ^ "The Border House Podcast Episode 1 Transcript". Borderhouseblog.com. November 1, 2011. Retrieved January 7, 2013. ^ Mass Effect 2 PS3 Video Review. YouTube. January 18, 2011. ^ "Top 7 Best New Franchises of this Generation". GamesRadar. November 8, 2010. Retrieved January 7, 2013. ^ "The Top 25 Xbox 360 Games". IGN. ^ Mass Effect 2 PS3 Announcement Trailer (HD). YouTube. August 17, 2010. ^ darklarke. "Mass Effect 3 Extended Cut". bioware.com. ^ "Mass Effect 3: New Ending Incoming". IGN. ^ Parfitt, Ben (January 29, 2010). "Mass Effect 2 sales top 2m". Retrieved March 2, 2015. ^ Sinclair, Brendan (February 11, 2010). "Mass Effect 2 takes silver as Jan. sales slip 13% - NPD". Retrieved March 2, 2015. ^ Wingler, Matt. "Mass Effect Sales Top 7 Million". Retrieved March 2, 2015. ^ Kendrick, Ben. "EA on 'Mass Effect 3′ Sales: Over 890K Copies Sold in First 24 Hours". Retrieved March 2, 2015. ^ Purchese, Robert (March 14, 2012). "Opening month US Mass Effect 3 sales double ME2's". Retrieved March 2, 2015. ^ "Mass Effect 3 makes over $200 million in sales". May 8, 2012. Retrieved March 2, 2015. ^ Sun, Leo. "What EA Must Do to Make 'Mass Effect 4' a Blockbuster". Retrieved March 2, 2015.